Regarding valid/ invalid deductive arguments. How is this ‘deductively’ valid (or invalid) since no claim of inference is being made? Or for that matter, how can it be considered an ‘argument’ at all if what is meant by an argument is an attempt at persuasion? A series of unrelated but true statements placed together in ‘argument’ form do not make a deductive argument if that is the intent. It isn’t a bad argument either, a bicycle isn’t a car even if the speaker wants it to be. No one in the real world would seek to persuade by forming such an ‘argument’. Please give an example of invalid argument with true premises and true conclusions that is not nonsense. And whatever you give, let that argument fail on logic not knowledge. The important thing here is to have a general method for solving this kind of predicate logic puzzle. Some people do it with the words, others with symbols, but it beats me how they manage. Best is a diagram. Get pen and paper and follow these instructions (it’s much easier to do than the instructions suggest at first sight, I’d draw the diagram in this answer but my computer skills aren’t up to it). Inspiring my research dissertation for my MA. The closest views to the truth that I have recently read. An “invisible government of vested interest” … which has been painted white by the media. how more accurate can you possibly get? The only question I ask here is: whether these governments are made solely of humans? What the powerful are selling to the populations – through the Media – tyranny, oppression and war! Is by definition inhumane. 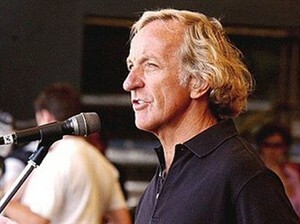 We have picked some of our favourite quotes from John Pilger during the talk, which give us an insight of his experience and understanding of media power, which is something we can all learn from. And he definitely puts it best. Has to seen to be believed! Is Chancellor Gideon on the donut topping again? cokehead kent! What on earth was going on with George Osborne at PMQs? Tonight’s seminar should be right up my street! The museologist Gaynor Kavanagh argues that museums must develop their “emotional literacy”, which accord­ing to her, means allowing the museum both to laugh and to cry together with its visitors, both to resist and to embrace the rage, bitterness, and confusion that is part of the trauma. This al­so means taking up well thought-out stances and asking oneself what one wants and can achieve by making painful experiences public. The unpleasant and troublesome aspect does not just concern human relations, but can also refer to objects which for various reasons arouse emotional resistance in museum officials. This can be, for example, political symbols, human re­mains, sexually charged objects, or things that are defined by many people as “rubbish“. Objects DETECTING DIFFICULT Y like this have been accompanied by turnabouts, manoeuvres, and conflicts in the museums, in some cases generating entertaining stories, a few of which are recorded in this book. The drawers of an individual curator’s desk have often been a haven for things that are far too problematic, while awaiting more favourable times. Section 60AA of the Criminal Justice and Public Order Act 1994 has been put in order by the Metropolitan police around Parliament Square a.k.a the heart of UK democracy. I’m interested as an artist in the heightened “Status of Objects of disobedience”. “Man is least himself when he talks in his own person. 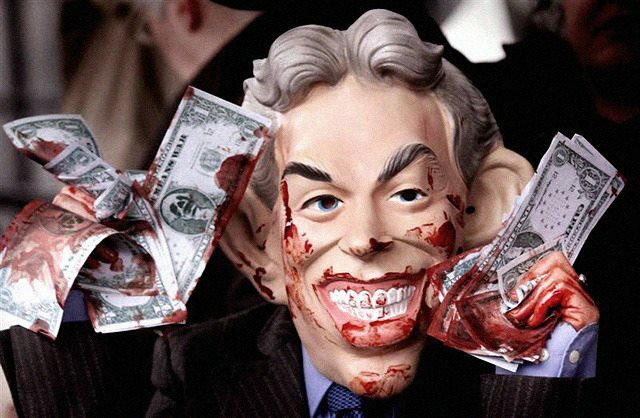 Warmonger Tony Blair Award Backlash – Save The Children? My Arse! Just think how generous Blair was donating all that depleted Uranium to the children of Iraq… What a guy! THE INTERNATIONAL charity Save the Children has been engulfed by a furious backlash from staff after it presented Tony Blair with a “global legacy award” in New York last week – despite privately acknowledging that he is a controversial and divisive figure. Amid widespread criticism on social media, many of the charity’s staff have complained that the presentation of the award has discredited Save the Children (STC). An internal letter, which gathered almost 200 signatures – including senior regional staff – in the first six hours of dissemination, said the award was not only “morally reprehensible, but also endangers our credibility globally”, and called for it to be withdrawn. It said that staff wished to distance themselves from the award and demanded a review of the charity’s decision-making process. “We consider this award inappropriate and a betrayal to Save the Children’s founding principles and values. Management staff in the region were not communicated with nor consulted about the award and were caught by surprise with this decision,” it said. The move has also raised questions about Save the Children’s (STC) integrity and independence because of close links between the former British prime minister and key figures at the charity’s helm. Its UK chief executive, Justin Forsyth, was a special adviser to Blair for three years, and Jonathan Powell, Blair’s former chief of staff, is currently on the board of STC. Blair was presented with the award by the US arm of the charity at a glittering “Illumination Gala” at the Plaza Hotel in New York on 19 November, in recognition of his “leadership on international development”. The charity cited two G8 summits hosted by Blair during his premiership which focused on debt relief for poor countries. At the Gleneagles summit in 2005, world leaders pledged to “Make Poverty History”. He also demanded STC rescind the award. Roth later corrected this to STC US. An online petition calling for STC to revoke the award said many saw Blair “as the cause of the deaths of countless children in the Middle East”. It had gathered more than 81,000 signatures by 1pm on Tuesday. According to an email sent last week by Krista Armstrong, the charity’s global media manager, to senior colleagues, STC has received a “high volume of complaints and negative reactions regarding the award”. The email acknowledged that Blair “is a hugely controversial and divisive figure in many parts of the world” and listed a number of questions that had been raised by STC staff, soliciting possible responses from her colleagues. In response, Eileen Burke, STC’s director of media and communications in the US, circulated “a line” explaining Blair was selected for the award for debt relief work and the Make Poverty History campaign. “Otherwise we are not in a position to respond to some of the geopolitical questions below,” she wrote in a separate email. In a statement, STC stressed that the award was given by the US arm of the charity, not by STC UK or Forsyth. It said the award was presented because of Blair’s work as prime minister on Africa and poverty. A spokeswoman for Blair said the former prime minister was “deeply honoured and moved to receive the award in recognition of his work”. Asked about the wisdom of accepting an award from an organisation with two former Downing St employees within its leadership, Blair’s office pointed out that the award was made by STC US. Since propelling Britain into the US-led war in Iraq in 2003, in the face of fierce opposition in parliament and among the public, Blair has regularly been accused of war crimes. He is expected to be strongly criticised in the report of the government-appointed Chilcot inquiry into the Iraq war, which is due to be published next year. On the day he stepped down as prime minister in 2007, Blair took up the post of special envoy to the Middle East Quartet, which mediates between Israel and the Palestinians. Palestinians and their supporters have frequently charged that, rather than a neutral interlocutor, Blair is strongly pro-Israel. Three years ago Tony Blair Associates, the former prime minister’s consultancy firm, signed a multimillion pound deal to advise the autocratic president of Kazakhstan, Nursultan Nazarbeyev. Blair and his companies also have lucrative consultancy contracts with Kuwait, the UAE and Colombia. Other areas of Blair’s post-Downing St work include African governance, faith, sport and climate change. Powell did not respond to Guardian requests for comment on Blair’s award and his role as a board member of STC. Forsyth’s salary at the Save the Children came under scrutiny last year when it was disclosed that he was paid £163,000 a year, including more than £22,000 in performance-related pay.